POSTPONED: Due to the poor air quality in the region, our race is rescheduled for Sunday, December 9th at 8 AM. 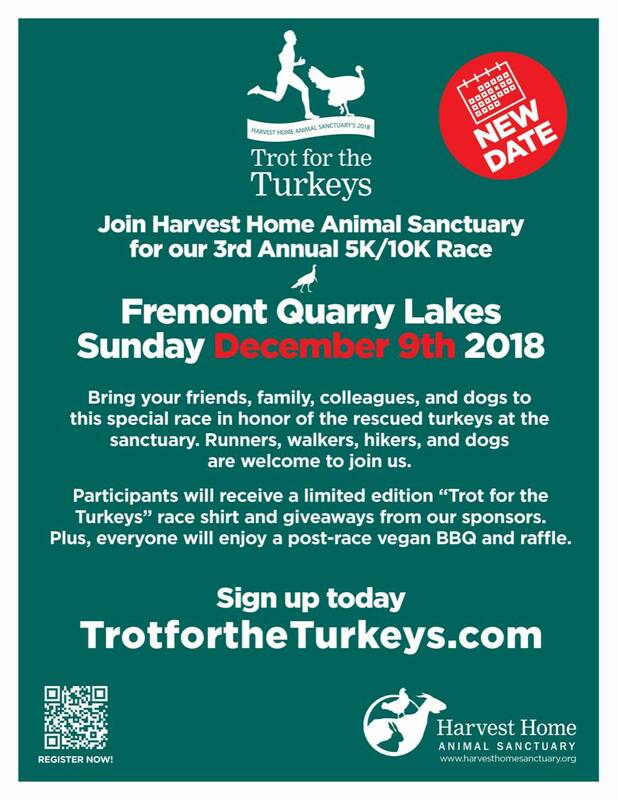 Join Harvest Home Animal Sanctuary for its 3rd Annual Trot for the Turkeys in the San Francisco Bay Area! 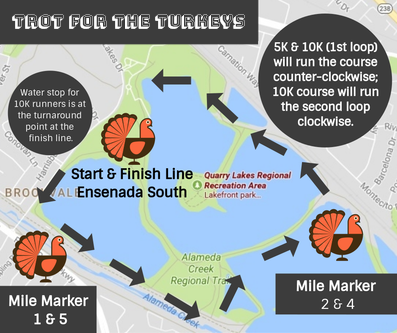 Bring your friends, family, colleagues, and dogs to this special race in honor of the rescued turkeys at the sanctuary. Runners, walkers, hikers, and dogs are welcome to join us. Participants will receive a limited edition “Trot for the Turkeys” race shirt and giveaways from our sponsors. Plus, everyone will enjoy a post-race vegan BBQ and raffle. Online race registration ends on Saturday, December 8th at 12:00 AM. Same-day race registration available. Parking Entrance Fee: $5 per vehicle. Dog Fee: $2 per dog. Guide/service dogs free. From I-880 in Fremont, take the Decoto Road exit east and proceed to Paseo Padre Parkway. Turn right on Paseo Padre, then left on Isherwood Way. Proceed to the park entrance on the right. From Mission Blvd (Hwy. 238) in Fremont, turn south on Nursery Ave. (away from the hills) and right (west) on Niles Blvd. Turn left on Osprey Drive and left on Quarry Lakes Drive. Proceed to the park entrance on the left. We welcome in-kind donations for our event raffle along with event sponsorships for the event. For more information, please email us info@harvesthomesanctuary.org.